Good (madaling-araw) morning to you loves! Announcing today, the winners of my GET RICH & NATURAL B.A.B. It was tough selecting the most deserving winners of this particular blowout. Why? I have to go through each of your answers to the question: Why do you think you deserve to win? To the winners, I plead that you let this business grow. :) Please wait for an email coming from me on how to claim your prizes. Prizes are non-transferable and not convertible to cash. 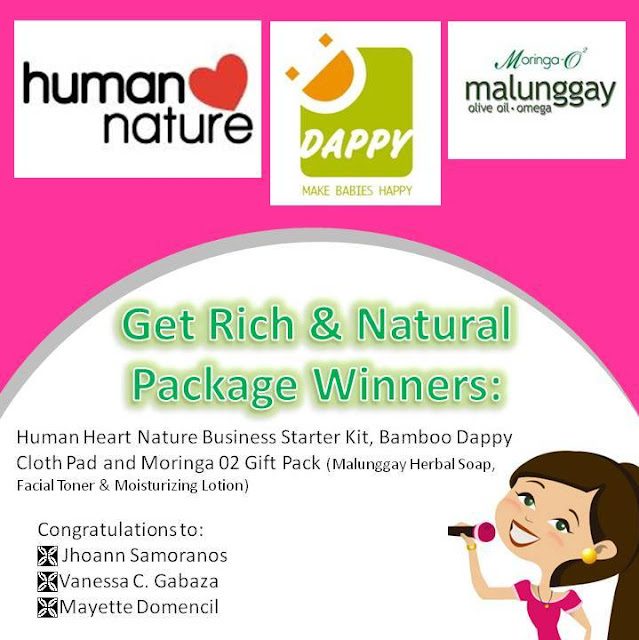 Winners will be registered as Human Nature dealers. Winners or their representative should be willing to claim the prize at the following venues: Ayala Ave., Makati City (exact time and location to be emailed) between 10am to 6pm only. Winners/representative should present a printed copy of my email and one (1) valid ID when claiming the prize. Wow! Mommy won! Congrats to other winners as well. Thank you Mommy Louise! For sure this business will be taken care of... We all mom look forward to things like this, it will surely be a big help!And I promise I will keep you posted on how this business will grow...thanks!